The Ottoman Empire reached its greatest territorial extent in Europe under the Köprülü grand viziers. The Köprülü era (بالتركية: Köprülüler Devri) (c. 1656–1703) was a period in which the Ottoman Empire's politics were frequently dominated by a series of grand viziers from the Köprülü family. The Köprülü era is sometimes more narrowly defined as the period from 1656-1683, as it was during those years that members of the family held the office of grand vizier uninterruptedly, while for the remainder of the period they occupied it only sporadically. The Köprülüs were generally skilled administrators, and are credited with reviving the empire's fortunes after a period of military defeat and economic instability. Numerous reforms were instituted under their rule, which enabled the empire to resolve its budget crisis and stamp out factional conflict in the empire. ^ Caroline Finkel, Osman's Dream, 253. ^ Finkel, Osman's Dream, 281. Ágoston, Gábor (2005). Guns for the Sultan: Military Power and the Weapons Industry in the Ottoman Empire. Cambridge: Cambridge University Press. Aksan, Virginia (2007). Ottoman Wars, 1700-1860: An Empire Besieged. Pearson Education Limited. Baer, Marc David (2008). Honored by the Glory of Islam: Conversion and Conquest in Ottoman Europe. Oxford: Oxford University Press. ISBN 978-0-19-979783-7. Darling, Linda (1996). Revenue-Raising and Legitimacy, Tax Collection and Finance Administration in the Ottoman Empire, 1560-1660. Leiden: E.J. Brill. Peirce, Leslie (1993). The Imperial Harem: Women and Sovereignty in the Ottoman Empire. Oxford: Oxford University Press. ISBN 0-19-508677-5. Rhoads, Murphey (1993). "Continuity and Discontinuity in Ottoman Administrative Theory and Practice during the Late Seventeenth Century". Poetics Today. 14: 419–443. Rhoads, Murphey (1999). Ottoman Warfare, 1500-1700. Rutgers University Press. Thomas, Lewis V. (1972). Norman Itzkowitz, ed. A Study of Naima. New York: New York University Press. İnalcık, Halil (1994). İnalcık, Halil; Donald Quataert, eds. 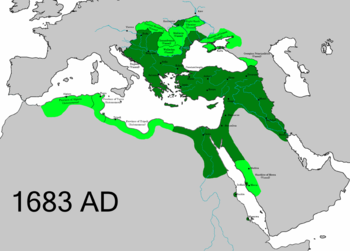 An Economic and Social History of the Ottoman Empire, 1300-1914. Cambridge University Press. ISBN 0-521-57456-0. Abou-El-Haj, Rifa'at Ali (1984). The 1703 Rebellion and the Structure of Ottoman Politics. Istanbul: Nederlands Historisch-Archaeologisch Instituut te İstanbul.